You may need to have you drains unblocked for a number of reasons, be it unsuitable material flushed down the toilet, grease build-up from the kitchen waste, tree roots growing into the drainage system or even original builder’s rubble or cement causing waste material to become snagged because the interior of the drainage is not smooth as it needs to be. Whatever the cause Blocksaway Drains have the solutions ranging from specialised implements fitted to drainage rods, electro-mechanical worm equipment with a range of cutters or high pressure water jetting at up to 4,000 p.s.i. to remove the blockages and give the drainage system a good flush through. Blocksaway Drains have the flexibility to tackle everything from blocked sinks, gullies, urinals or toilets through to main sewers. 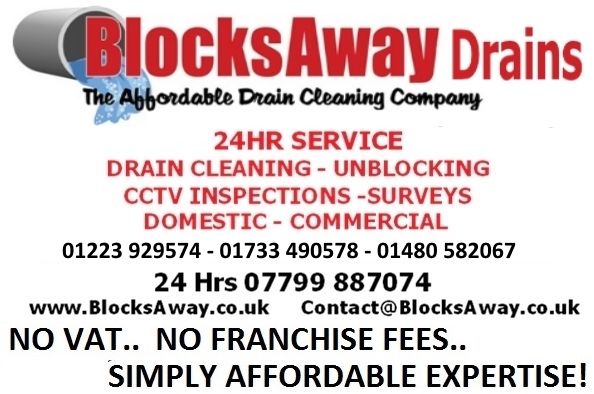 Contact us to get your drains unblocked for an affordable price at a time convenient to you. We cover Cambridge, Huntingdon, Peterborough, throughout Cambridgeshire and beyond.